After a two-month search, a B.C. woman has been reunited with her ceremonial dance regalia thanks to help from the community in Prince George, B.C. Randi Gardypie, who is Beardy's and Okemasis' Cree Nation in Saskatchewan, was working in northern B.C. when her truck was broken into in May. 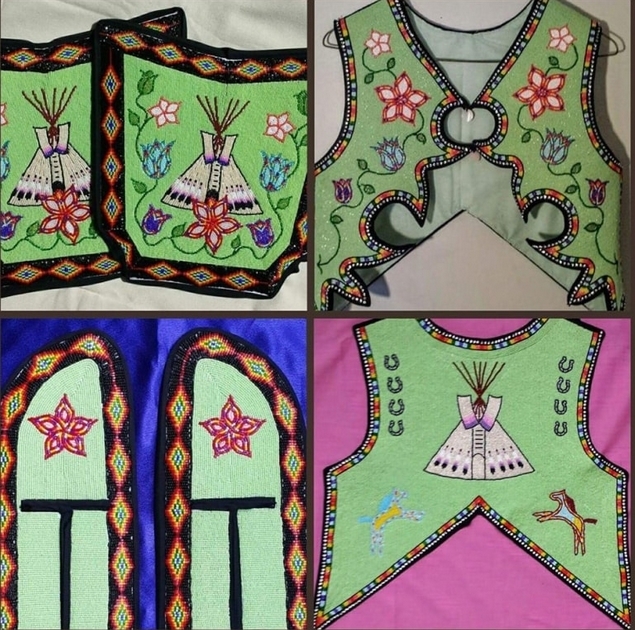 Gardypie's handmade jingle dress, beadwork, vest, feathers and sewing machine were taken. "It was complete devastation, I felt like I got hit with a ton of bricks," she said. Gardypie was lost without the one-of-a-kind regalia which took years to make, she said, and gave up circle dancing this summer because the items are integral to the ceremonies. "It symbolizes who they [dancers] are, and where they're from, and their ancestral lineage," said Gardypie. A few days after the theft, Gardypie's jingle dress was found by a Prince George man. Keith LaRiviere part of the Cree First Nation, was throwing something away and noticed a jingle dress at the bottom of a dumpster, so he jumped in and pulled it out. "I know the importance of that, what it means to a person," LaRiviere said. He saw a post circulating on social media about the missing items and started putting up posters around town in the hopes of having the other items returned. "That's what you do, you go to help. If you see someone in this kind of distress and you're a part of this circle, you're a native person, and this is what you do," said LaRiviere. This week, a family found a bin containing most of Gardypie's remaining gear in their shed and called the number on the poster. Gardypie says she couldn't believe so much of her dance regalia had been found. "It means the world to me," said Gardypie. "I'm on edge, I'm super excited." RCMP said the theft was reported to them but there were no leads and, now that the items have been found, the file is closed. Responses to "B.C. woman reunited with stolen sacred ceremonial dance regalia"